I recently received a concerned email from a member of the inMotionNow team. She had just gotten a copy of a report comparing popular project management tools, and inMotion wasn’t on it. Uh-oh. The report was restricted to project management tools with features like Gantt charts, Kanban boards, and live chat. The thing is, many of those features aren’t part of what inMotion offers because our users don’t need them. So inMotion doesn’t look exactly like all the other project management tools. 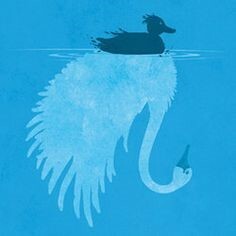 I was reminded of one of my favorite childhood books, The Ugly Duckling. (I was an awkward looking kid.) You know the story: the little bird that wasn’t shaped like the other ducklings, wasn’t the same size as the other ducklings, didn’t sound like the other ducklings – because he wasn’t a duckling at all. He was something else entirely. Yes, inMotion shares many features with project management, just like a swan shares features with a duck. But project management tools, while common and familiar, are generalizers. They’re built to support a wide variety of users – IT teams, programmers, construction companies, etc. That kind of generalization means that users must spend time figuring out how to set up their project management tool to fit the way they work. For a creative team, that might mean figuring out how to let clients submit project requests, or how to track which projects have proofs in review. Unlike project management tools, inMotion is specialized. It’s a creative workflow management system built to help marketing and design teams get assets created and out to market faster. With inMotion, a creative team starts with a built-in workflow: intake project requests, turn those requests into projects, and automatically route proofs for review and approval. Those request forms, project templates, and routing workflows are all customizable so teams can tailor inMotion to fit their workflow – but without having to build that workflow from the ground up. It turns out that inMotion isn’t a project management software at all. It’s a beautiful swan. Learn more about what makes creative workflow management so much more than a typical PM tool.